View More In Feeder Parts & Accessories. The Boss Buck large 12-volt system comes with a high torque motor, and paddled spinner. The steel box features an exclusive Directional cap to create optimum seal inside the spinner housing. This creates maximum velocity for a consistent throwing distance. Uses a 12-volt re-chargeable battery (sold separately). Includes 4 self tapping screws to mount it to any flat surface. 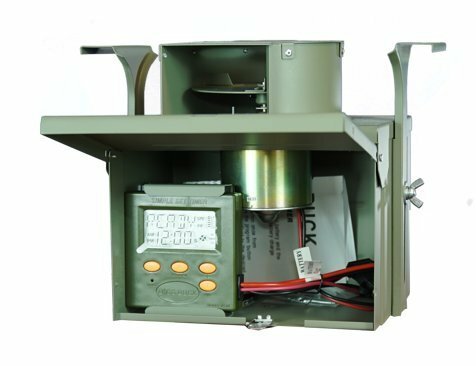 Defined knock-outs are on the side and back of each box to mount custom Boss Buck solar panels (Sold Seperately).The simple set digital timer is included and feeds up to 6 times per day, from 1 to 30 seconds each time. If you have any questions about this product by Boss Buck, contact us by completing and submitting the form below. If you are looking for a specif part number, please include it with your message.